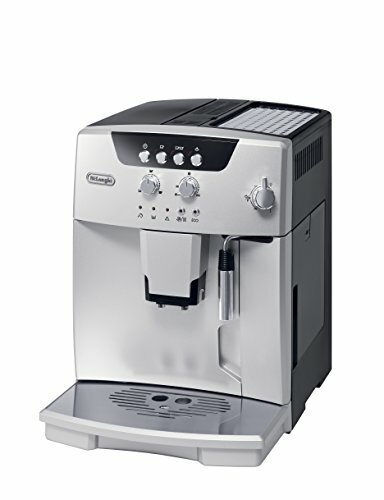 Enjoy exceptional espressos, bold cappuccinos and creamy lattes in the Comfort of your home, any time of day or night with the De'Longhi magnifica fully automatic espresso and cappuccino machine. It's never been easier to create barista-style beverages with the adjustable manual cappuccino system; the manual frother mixes steam and milk to create a rich, creamy froth for evenly-textured drinks, just the way you like them. Simply place a pitcher with milk under the nozzle and let the machine do all the work. Satisfy all tastes and preferences; choose to brew either whole beans or pre-ground. The de’longhi magnificant features an integrated stainless steel burr grinder with 13 adjustable settings and tubeless technology, which grinds fresh beans every time to ensure maximum freshness in every cup. With various Coffee strength settings, everyone gets their ideal flavor. The choices don't end there - select from cup size options to suit your preferred taste. Other highlights include easy-to-use manual controls, as well as a cup warmer and a removable drip tray. The de’longhi magnificant has mastered the art of espresso-making for you and will be a welcome addition to your kitchen counter. If you have any questions about this product by De'Longhi, contact us by completing and submitting the form below. If you are looking for a specif part number, please include it with your message.